Since going live we’ve had some technical glitches that required us to take the site off-line. We had always anticipated certain teething issues, but had been hoping to resolve these without interrupting operations. The difficulties we encountered were primarily to do with our credit card platform, and as much as we’d like to be giving whisky away to for free (hey we’re all part of the great whisky brotherhood), we had heard somewhere that in business it’s a fairly important to get paid, hence the more dramatic measures. If you’ve been trying to access the site in the past week, a big thanks for your patience and for bearing with us. I guarantee you that it will have been worth it. The return to live status was also delayed because we were adding a special feature to the site – a Father’s Day offer courtesy of Bell’s. 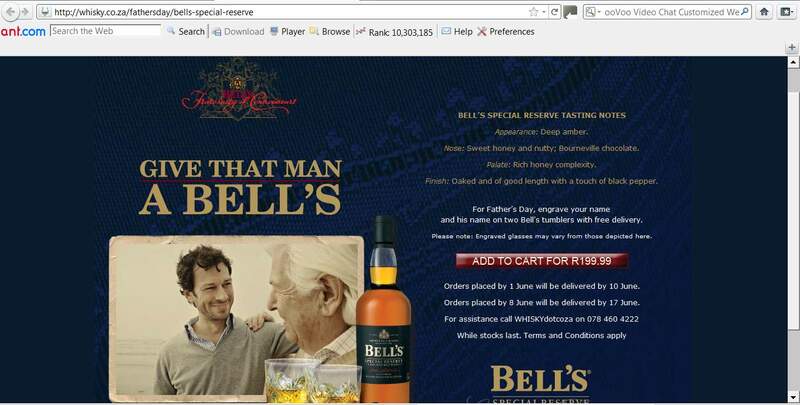 The guys at Bell’s have kindly allowed us to extend the offer to readers of Words on Whisky, and to the fledgling customer base of WHISKYdotcoza. The promotion is specific to Bell’s Special Reserve, the blended malt in the Bell’s portfolio, which I recently had the opportunity to taste (the report is here), and it includes a set of custom engraved tumblers and delivery to anywhere in SA, both gratis. If you’re keen to partake simply click here and follow the instructions given. I’d also like to encourage you to visit the Bell’s website and join the Bell’s Fraternity of Connoisseurs so that their team can keep you informed about future offers and events. Please try the site and let us know your thoughts about it. We are committed to becoming the country’s premier whisky e-tailer, and we’re very serious about what potential customers think and feel about it. We can’t promise to implement all the feedback, but we will read and consider each and every single suggestion. So, as we face a brave new week, may the dram be with you.